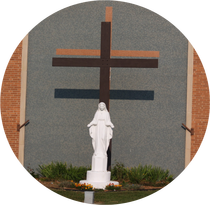 In the name of Jesus, St. Margaret School will provide a firm educational foundation of religious values and academic knowledge for each student in a Catholic, nurturing environment. The aim of Catholic education at St. Margaret School is to assist each child to develop spiritually, academically, psychologically, physically, and socially to his/her full potential with the affirmation of parents. We are a Christ-centered school in which theology is taught on a daily basis as well as woven into the entire curriculum. Children participate in various Catholic activities including, but not limited to: weekly Mass, rosary, prayer room and adoration. Parents are the first educators of their children; therefore cooperation between home and school is essential. The education staff takes a collaborative approach to meeting the needs of each child. The complete development of the child goes beyond academics and incorporates spiritual and social development. Service to the school, local and global community is part of the educational process and fulfills our spiritual calling.